After the success of last year's event, the Old Erie Canal Boat Float is back! Over 500 paddlers participated in the 2018 Boat Float! This year we will also be helping to kick off the new Erie Canalway National Heritage Corridor “Canalway Challenge”! 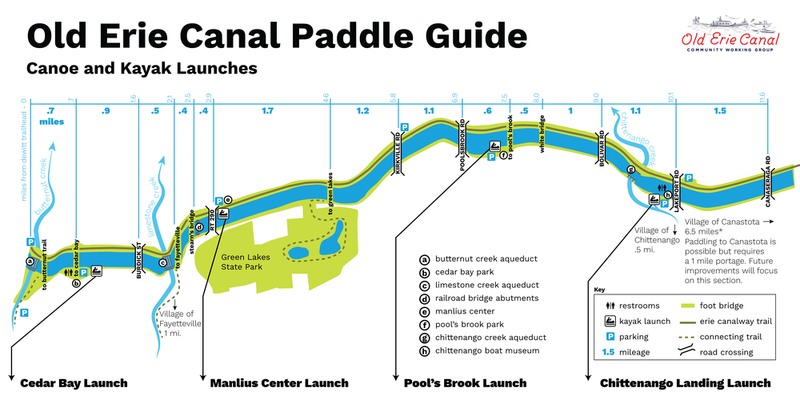 Paddle the scenic and calm waters of the historic Old Erie Canal! 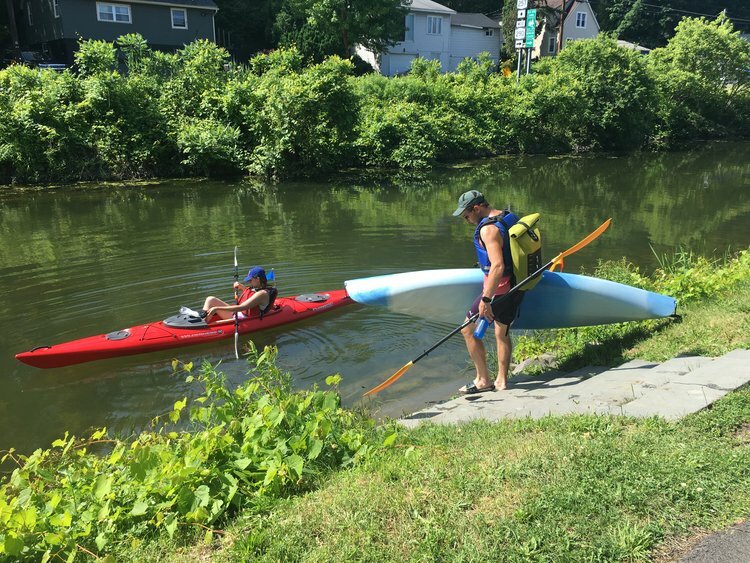 Let's fill the Old Erie Canal waterway with colorful kayaks, canoes, and paddleboards! Be part of the Boat Float Group Photo! Choose from 4 launch locations depending on your preferred distance. All paddlers end at the Chittenango Landing Canal Boat Museum at 2 pm for the Boat Float Bash with music, entertainment and food trucks, and our mega-group panoramic photo ! Noon: Chittenango Landing Canal Boat Museum launch. This is an out and back launch location. Paddlers should put in at the Chittenango Landing Canal Boat Museum and travel west for their preferred distance. The Chittenango Creek Aqueduct is .4 miles west of the boat museum. BEFORE REGISTERING SEE IMPORTANT “INFORMATION TO NOTE” BELOW. Please note that restrooms are only available at Cedar Bay and at the Chittenango Landing Canal Boat Museum locations. Personal flotation device usage is required. Photographs and/or video will be taken at this event. By taking part in this event you grant Chittenango Landing Canal Boat Museum (CLCBM) full rights to use the images resulting from the photography/video filming, and any reproductions or adaptations of the images for fundraising, publicity or other purposes to help achieve CLCBM aims. This may include (but is not limited to), the right to use them in printed and online publicity, social media, press releases and funding applications. If you do not wish to be photographed, please inform the CLCBM director or event supervisor. Liability Release - To participate in the Boat Float event you must release Chittenango Landing Canal Boat Museum of liability for any injury to your person or property. Full information on this release is provided in the document referenced in this Liability Release. Transportation is not provided back to your car, please coordinate with fellow paddlers or register for the shuttle. Chittenango Landing Canal Boat Museum. Please reserve by June 14th. Call the museum (315) 687-3801 or email info@clcbm.org. Oswego Expeditions. Must reserve by June 1st. Includes paddle, PFD, and boat delivery (drop off and pick up). Call (315) 561-0223 or email oswegoexpeditions@gmail.com. Morse Kayak Rentals in Cazenovia has kayaks and stand-up paddleboards for rent. Reserve by phone at 315-655-2400. Must be reserved by the Friday before the event. Follow Cedar Bay Road to the parking lot for Cedar Bay Park. Turn right into the parking lot. Follow the the short trail at the east end of the parking lot to the boat launch. A large parking lot dedicated to Old Erie Canal State Park users is located at the convergence of Green Lakes Road, Manlius Center Road (Rt. 290), N. Manlius Street, and Minoa Road. The Boat launch is a series of stairs at the end of the path leading to the canal trail from the parking lot. Parking is severely limited, we highly suggest you register for the shuttle. From Route 5 turn north on to 290/Green Lakes Road. After about 1 mile take a right onto Kinderhook Road. After about 3/4 mile turn right onto Poolsbrook Road. After about 1/2 mile turn right onto Andrus Rd. Take the first left into the driveway for Pool's Brook Park. Follow signs for the canoe launch. The launch is at the Chittenango Landing Canal Boat Museum, on the canal feeder just before it reaches the canal. Volunteers will be on site to direct you to parking and the launch location.